Step out of the city life by going to Pointe d'Esny and Mont Choisy Beach. 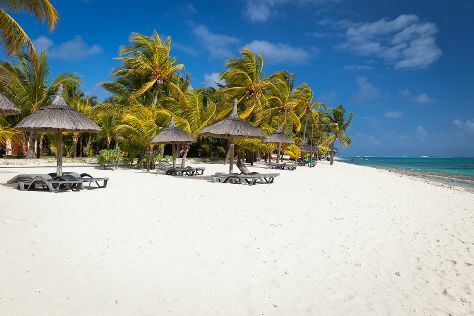 Visit Bain Boeuf Public Beach and Belle Mare Beach for some beach relaxation. Venture out of the city with trips to Ile Plate Beach (in Cap Malheureux), Belle Mare (Scuba & Snorkeling & Speed Boats Tours) and Siva Soopramaniar Kovile Bel-Air Riviere Seche (in Bel Air). There's still lots to do: look for gifts at Historic Marine, enjoy the sand and surf at Bras d'Eau Public Beach, tour the pleasant surroundings at Grand Gaube Beach, and take in nature's colorful creations at SSR Botanic Garden. To see reviews, ratings, where to stay, and more tourist information, read our Grand Baie trip itinerary app . Los Angeles, USA to Grand Baie is an approximately 28-hour flight. Traveling from Los Angeles to Grand Baie, you'll lose 12 hours due to the time zone difference. Expect somewhat warmer weather when traveling from Los Angeles in December: highs in Grand Baie hover around 85°F, while lows dip to 74°F. Finish up your sightseeing early on the 9th (Sun) so you can travel to Rodrigues Island. Eschew the tourist crowds and head to Île aux Cocos and Cathédrale St Gabriel. Escape the urban bustle at Scuba & Snorkeling and Grand Montagne Nature Reserve. And it doesn't end there: tour the pleasant surroundings at Trou d'Argent Beach, head off the coast to Cat Island (Ile aux chats), and take in the architecture and atmosphere at St Johns Church. To find where to stay, traveler tips, reviews, and tourist information, read Rodrigues Island trip builder site . Do a combination of car and flight from Grand Baie to Rodrigues Island in 3 hours. Alternatively, you can do a combination of car and ferry. In December, daily temperatures in Rodrigues Island can reach 85°F, while at night they dip to 75°F. Finish your sightseeing early on the 12th (Wed) so you can travel to Le Morne. Relax by the water at La Cambuse Beach and Gris Gris Beach. Do your shopping at Rhumerie de Chamarel and Le Dernier Comptoir. Go for a jaunt from Le Morne to Riviere Noire to see Les 7 Cascades about 58 minutes away. The adventure continues: fulfill a lifelong dream with a swim-with-the-dolphins experience, explore the activities along Underwater Waterfall, get up close to creatures of the deep with a dolphin and whale watching tour, and tour the pleasant surroundings at Heritage Nature Reserve. To see photos, more things to do, where to stay, and other tourist information, refer to the Le Morne route website . Traveling by combination of flight and car from Rodrigues Island to Le Morne takes 3 hours. Alternatively, you can do a combination of ferry and car. December in Le Morne sees daily highs of 85°F and lows of 74°F at night. Finish your sightseeing early on the 17th (Mon) so you can travel back home.